We are ready to provide whatever information you might need both before and during your stay, whether it is ideas of places to visit, where to go shopping for particular items or where to go for a night out. Holidays apartments rental in Sciacca. 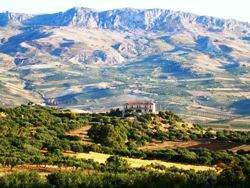 Our apartments rental are in a villa on the hill overlooking Sciacca on the south west cost of Sicily. The ground floor of our villa has recently been converted into three holidays apartments. Accommodation Casale Galati offers spacious fully furnished apartments for rent with one, two or three bedrooms, well equipped kitchens and private bathrooms. The apartments are of the highest standard for yours free from stress vacation in Sicily. While you staying at Casale Galati can easily go for a day trip to visit beautiful surrounding sightseeing: Agrigento, Eracle Minoa, Segesta. As you take the drive up to the house you will be spoilt with the hilltop views of the rolling countryside. Arriving at night and you will more than likely be amazed by the most spectacular starry skies. Copyright 2007(Casale Galati). Design by Andreas Viklund.